The Ordinary Life of an Extraordinary Girl: Out smarted again! Yesterday morning, as I preparing in my mind the conversation I was going to have with Alex about exercising, she one upped me - again - I might add. Alex came downstairs with her tennis clothes on, her tennis racket and her backpack. She announced that today we were going to play tennis, then go swimming and then have veggies for lunch. Considering less than 24 hours earlier I had read her the riot act about her weight -this was a big surprise. Wow - I thought - feeling rather proud of my parenting skills - perhaps I have really made an impression on her this time. Perhaps she really does want that i-pod more than she wants food! I was only partially right, because, just like my other kids, Alex was hustling me. There is always some other angle going on in her mind. Sound familiar? It is a daily puzzle trying to keep on top of what it is she really wants.....This time - she wanted to see David! David, shown above, is another one of countless unsong heroes that has been a part of Alex's life. I asked if I could take a picture of him with her and he agreed. Alex, of course, was more than happy to pose with him. I'm sure that is quite obvious! 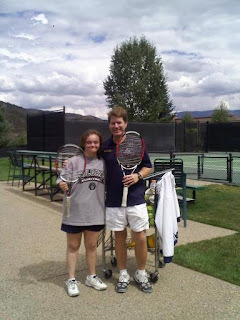 David is the tennis pro at the local club and taught Alex how to play tennis. She certainly will never compete in any matches - but she can hit the ball and most importantly she enjoys it. She even has the lingo down and told her father he had a great overhead. Not sure I got complemeted - but I am okay with that (mostly). I am so thankful that he has shared his love of the sport with my daughter. Tennis was fun - and since David was giving someone else a lesson - Alex, John and I were able to hit the ball for about 45 minutes. Somehow, Alex was able to sense that David was free and decided her feet and back hurt and off she went. I knew she was hustling me again - but I was happy we had run her around for that long. Despite the attraction and distraction of the tennis pro - we were able to get to the pool. We did have veggies for lunch, instead of the preferred diet of cheeseburger and fries, and we ended up watching a volley ball tournament. It was a fun, family day with Alex - the type of day I often dream about. Some days are very, very, good.